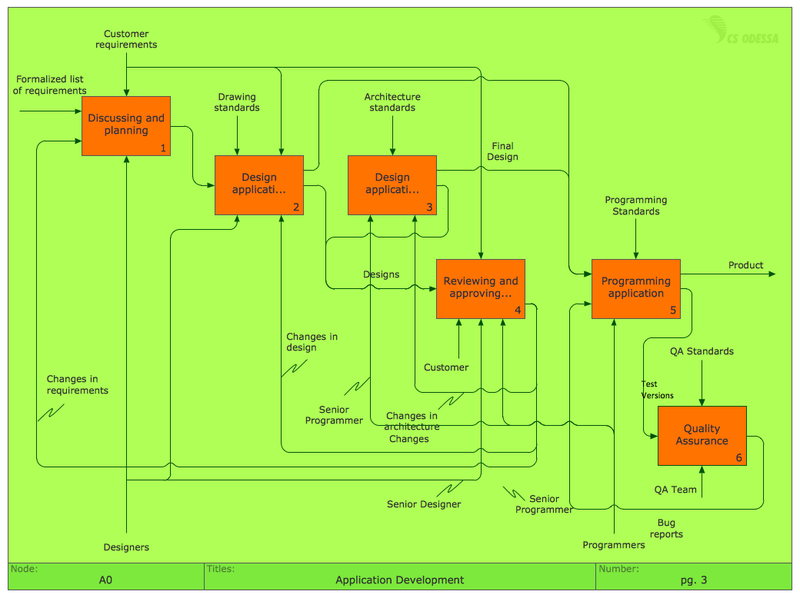 Flowchart is a map or graphical schematic representation of a process. 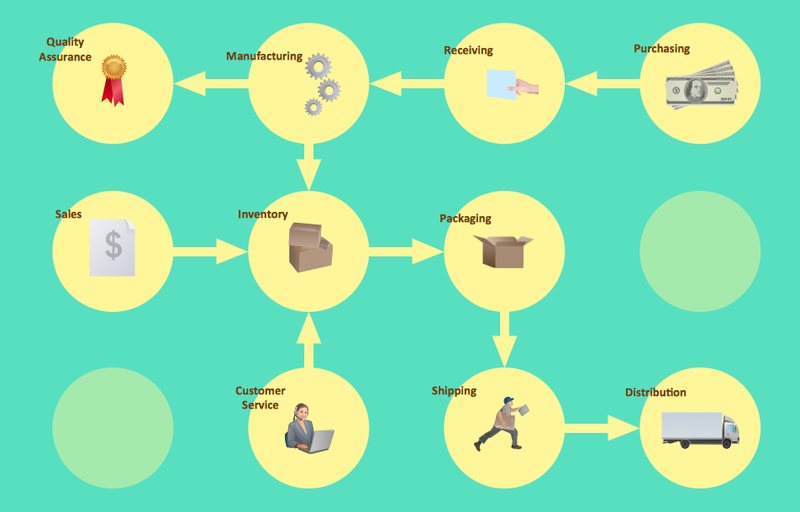 Flowchart is a simple mapping tool that shows the sequence of actions within a process. 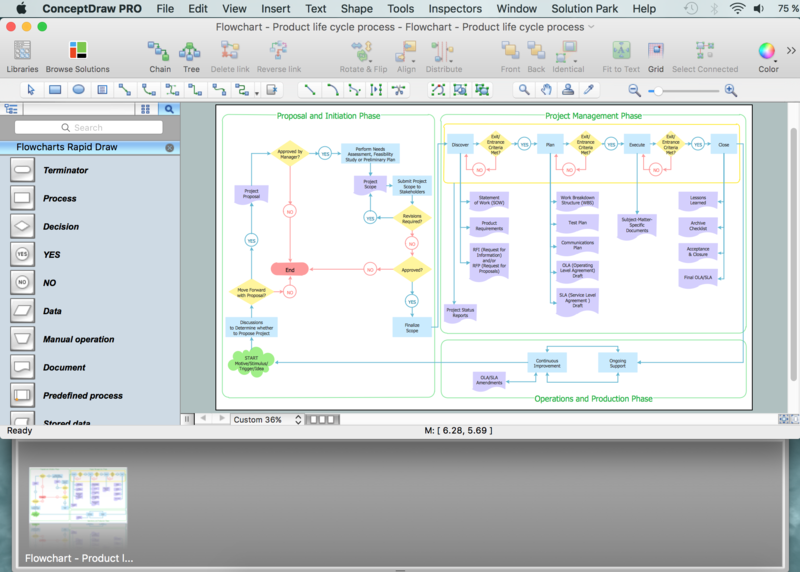 ConceptDraw DIAGRAM is professional flowchart software. ConceptDraw Solution Park is rich set of stencils and extentions for work. It let to create professional-looking flowcharts based on pre-drawn flowchart templates and examples. It will assist you in drawing your flow charts with minimal effort and makes it very easy for beginners to draw professional looking flowcharts. Includes suitable connectors and styles or designs to ease the process of creating complex flowcharts. So, if you are facing difficulty in creating flowcharts or workflow is slowing you down then consider using flowchart software with pre-drawn flowchart symbols to enhance your productivity and speed. Free flowchart templates, symbols and examples will help to quickly create new flowcharts, workflow, NS Diagram, BPMN Diagram, Cross-functional flowcharts, data flow diagrams and highlight flowcharts. Numerous colors, fonts, shapes, styles, and symbols for each object in your flowchart are available to create your own templates that can be saved for future use. and share them with colleagues. Flowcharts are a very good way to get a new idea explained in a presentation. 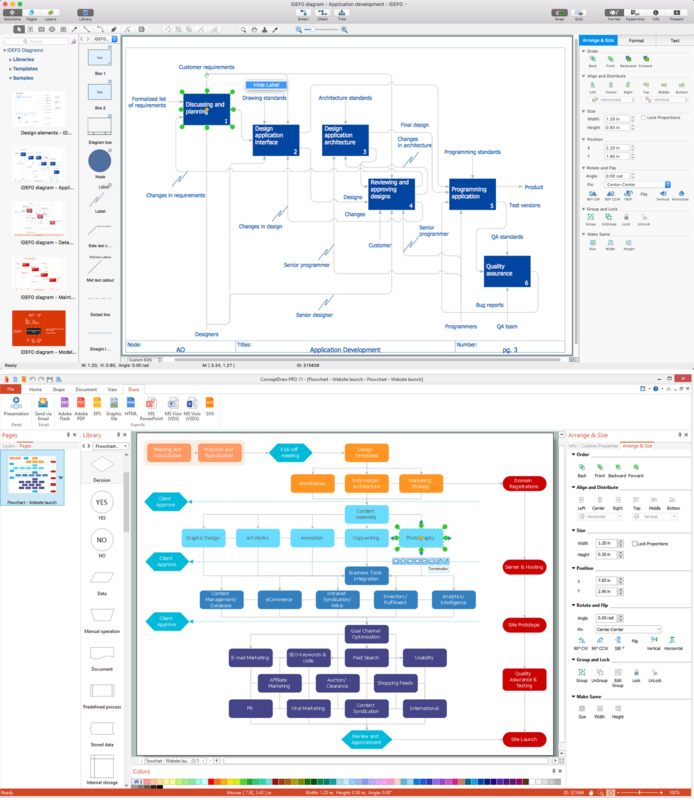 ConceptDraw flowchart software has some great new tools for creating a visual appealing flowchart, workflow and business process quickly and easily. To efficiently create the flowchart, it is best to start from the flowchart example and templates. Once you have the basic flowchart complete, it's time to change the theme effect to everything. Here are a few shots of what you can do. This is the different colors you can make the shapes. You do not need to be graphic design expert to insert professional looking content. Another feature is inserting hyperlink and define data. This allows you to navigate the flowchart easier. A good way to help the flowchart stand out better is to change the background of the document and insert clipart. There are some simple flowchart examples made with the steps and different options shown above. Vector-based flowcharting software, which facilitates the rapid creation of flowcharts, workflows, process flowcharts and more. Rich pre-drawn templates. Includes basic flowcharts, organizational charts, business charts, hr diagrams, work flowcharts, programming flowcharts, process flowcharts and network design diagrams. Powerful functions. No artistic skill required. What you see is what you get. Create your professional diagrams with minimal effort and time. Automatically aligns and arranges everything to look great. Works easily with other programs. With a single button-click import to Word, Excel, equation files. Insert your ConceptDraw charts into other documents in just seconds. XML file format. Save in many common graphic formats and print exactly what you see. Enhanced export features include BMP, JPEG, PDF, SVG, HTML, Multiply TIFF and SlideShow, to name a few. Live update — you will be notified when a new version or new templates are available for download. You can download the new version directly from within the program. Conceptdraw Flowchart Software can also create organization charts, network diagrams, building plans, business presentations, and other diagrams. Design and document using a wide range of pre-drawn flowchart shapes and smart connectors. ConceptDraw Flowchart will assist you in drawing your flowcharts with minimal effort and makes it very easy for beginners to draw professionally designed flowcharts. ConceptDraw also includes suitable connectors and styles or designs to ease the process of creating complex flowcharts. So, if you are having difficulties in creating flowcharts or workflow is slowing you down then consider using ConceptDraw flowchart software to enhance your productivity and speed. Thank you! Your flowchart program is outstanding! 1. ConceptDraw uses the familiar Microsoft Office user interface, and it looks great! 2.Fast and small! 3.Has the right features! 4.Affortable price. I hope you keep the promotion price. Home users and students can't afford software like Visio. I can't recommend this flowchart software enough. ConceptDraw has unbelievable functionality for the price. Makes stunning flowcharts like nobody's business. It's such useful software in such a small package, and goes to show how bloated today's software truly is. 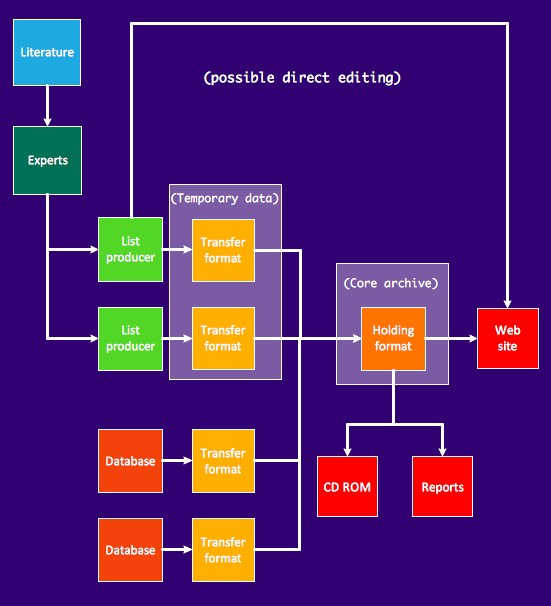 Best of all, it can export the flowchart to many different kinds of formats. I made my flowchart and exported it as a jpg file, so I could put it on my website. Real easy! ConceptDraw will help you visualize and structure information, add illustrations and drawings to your documents and make all this rapid and easy. That's possible thanks to the program's intuitive interface, easy-to-use drawing tools, and lots of pre-drawn library objects. Abundant flowchart templates, flowchart symbols and flowchart samples helps to quickly create most common flowcharts. Great value for money! If flow diagrams are the only thing you plan to use it for, Visio is a little overkill. If you want to use it for other things it's better value for money. Visio is too expensive for my taste, and now I've found ConceptDraw theres no need for other products. Flowchart software similar to Visio Flowchart software for Mac and Windows (ConceptDraw works great on Mac and Windows). I just wanted to write ConceptDraw is great value for money! (It is very easy to use too!) Thanks.